O Alaska e maior do que muitos países. O estado apresenta desde picos nevados a orlas arenosas, de rios azul-esverdeados a picos de montanhas gelados. E os povos do estados são tão diversos quanto a paisagem. Um fato que surpreende a maioria dos turistas e de que o Alaska abriga 11 culturas Nativas, cada uma delas com língua e estilos de vida distintos. ATHABASCAN – a terra tradicional dos Athabascan vai do vasto interior do Alaska estendendo-se ate a fronteira com o Canada’, na região do Ártico, até o Cook Inlet na região sul central. Os Athabascan eram povos migratórios, seguindo peixes e caca ao longo dos cinco maiores rios da região. Eles construíam vilas de inverno e acampamentos no verão; e viviam e se deslocavam em pequenos grupos de 20 a 40 pessoas. EYAK, HAIDA, TSIMSHIAM, TLINGIT – Nos últimos 10.000 anos, a geografia era o elo de ligação dos povos Tlingit, Tsimshian, Haida e Eiak. Estes grupos construíram ricas culturas baseadas nas aguas do Pacifico e das verdejantes florestas tropicais do norte. Tradições artesanais baseadas nos recursos locais, particularmente em habilidades como esculpir a madeira e tecelagem, continuam a influencia-los nos dias de hoje. Suas esculturas de madeira podem ser vistas em totens e canoas bem como em utensílios e pecas cerimoniais. INUPIAQ & ST. LAWRENCE ISLAND YUPIK – Os Inupiaq e Yupik da ilha de St.Lawrence, cujo nome significa “Pessoas Reais” na sua Língua nativa, vivem nas áreas norte e noroeste do estado. Estas culturas continuam um estilo de vida de subsistência e vivem principalmente do que a terra lhes fornece, caçando baleias, focas, leão marinho e colhendo todo tipo de cerejas na estação. Para os povos que vivem no norte, o clima extremo do ártico não constitui uma barreira. Ao invés disto, eles veem a terra como um ambiente de abundancia que prove uma variedade de mamíferos, pássaros e peixes necessários para sua sobrevivência. UNANGAX & ALUTIIQ (SUGPIAQ) – A vida nas aguas ricas e de rápidas mudanças e’ a base da cultura dos Unangax e Sugpiaq. Estas duas culturas são encontradas no sudoeste do Alaska e nas Ilhas Aleutas. Os povos Unangax e Sugpiak viviam uma existência marítima em que a agua determinava seu estilo de vida. A comida provinha principalmente do oceano e dos rios. Sua vestimenta, que precisava ser ‘a prova d’agua, era feita com peles bem costuradas e atadas. Os caiaques dos Unangax e Sugpiaq eram diferentes das outras embarcações devido a sua construção diferenciada, permitindo maior velocidade e aproveitamento aquático. YUP’IK & CUP’IK – Atualmente, os Yup’ik e Cup’ik, cujos nomes provem do dialeto de suas Línguas nativas, continuam a viver um estilo de vida de subsistência no sudoeste do Alaska. Historicamente, os povos Yup’ik e Cup’ik viajavam com o trajeto migratório da caca e dos peixes, estabelecendo acampamentos temporários em cada estação do ano. As vilas eram organizadas ao redor dos grupos familiares, e a graduação era determinada pelas habilidades que um individuo oferecia para a comunidade. Os mais velhos contam historias do estilo de vida tradicional para os mais jovens, sobre sua herança cultural. Esta e uma tradição que continua dos dias atuais. Alaska is bigger than most countries. The state encompasses everything from snowy peaks to sandy shorelines, from blue green rivers to icy white mountaintops. And the state’s people are just as diverse as the landscape. A fact that surprises many visitors is that Alaska is today home to 11 Alaska Native cultures, each with distinct languages and ways of life. ATHABASCAN – The traditional Athabascan homeland in Alaska’s interior is vast, stretching from the state’s Canadian border in the Arctic Region to Cook Inlet in Southcentral Alaska. The Athabascan were migratory, following fish and game along the region’s five major rivers. They built winter villages and summer fish camps and lived and travelled in small groups of between 20 to 40 people. EYAK, HAIDA, TSIMSHIAN, TLINGIT – For the past 10,000 years, geography has been the common thread connecting the Tlingit, Tsimshian, Haida and Eyak peoples. These groups have built rich cultures based on a mutual landscape of Pacific waters and verdant northern rainforests. Artisanal traditions based on local resources, particularly in skills such as carving and weaving, continue to thrive among them today. Their carvings can be seen on totems and canoes, as well as utensils and ceremonial objects. INUPIAQ & ST. LAWRENCE ISLAND YUPIK – The Inupiaq and the St,Lawrence Island Yupik people, whose name means “Real People” in their language, live in the north and northwestern area of the state. These cultures continue a traditional subsistence lifestyle and largely live on what the land provides, still hunting whales, seals, walrus and gathering berries in season. To the people of the north, the extreme arctic climate is not a barrier. Instead, they view the land as a bountiful environment providing a variety of mammals, birds and fish necessary for their survival. UNANGAX & ALUTIQ (SUGPIAQ) – Life on the rich and rapidly changing water is the basis of the Unangax and Sugpiaq culture. These two cultures are found in southwest Alaska and the Aleutian Islands. Unangax and Sugpiaq lived a maritime existence where water determined their way of life. Food came primarily from the ocean and rivers. Their clothing, which needed to be waterproof, was made of tightly-sewn skin. The kayaks of the Unangax and Sugpiaq were unique from other boats due to their split bow construction, allowing for greater speed and seaworthiness. 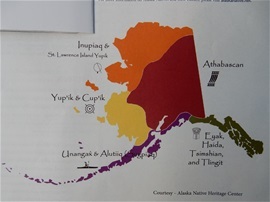 YUP’IK & CUP’IK – Today, the Yup’ik and Cup’ik, named after their languages dialect, continue to live a subsistence lifestyle in Southwest Alaska. Historically, the Yup’ik and Cup’ik people traveled with the migration of game and fish, setting up seasonal camps. Villages were organized around extended family groups, and rank was determined by the skills an individual offered the community. Elders tell stories of traditional ways of life to teach younger generations about their heritage. It is a tradition that continues today.